Nanotechnology's potential for improving drug delivery, tissue regeneration and laboratory miniaturization is being explored by a diverse array of University of Michigan researchers. The nose, usually the first line of defense against inhaled airborne particles that could damage the lungs, may itself be susceptible to the dangers of nanoparticles, which are less than 100 nanometers in size. Recent experiments at Stanford and the Advanced Light Source in Berkeley have shown that carbon nanotubes are a promising material for storing hydrogen safely, efficiently and compactly. The Center for Science, Technology and Public Policy (CSTPP) at the University of Minnesota Humphrey Institute of Public Affairs has released a new report that explores and evaluates models for the oversight of nanotechnology. The Royal Swedish Academy of Engineering Sciences (IVA) has started a project intended to gather Swedish expertise and players interested in developing Swedish nanotechnology. Some concerns over the safety of nanotechnology-enabled medical therapies have been alleviated after a study has revealed an absence of toxic side effects during their use. A new study clearly shows the importance of a lotus leaf nanoscale hair-like structure on its self-cleaning ability. Specific targeting of tumor cells is an important goal for the design of nanotherapeutics for the treatment of cancer. A subset of viruses with natural affinity for receptors on tumor cells could be exploited for nanotechnology applications. Researchers from the German Fraunhofer Nanotechnology Alliance have developed bio-functional nanoparticles that can destroy cancer cells. Using two brightly colored fluorescent nanoparticles, a team of investigators has developed a method of counting single biomolecules as they flow through the channels of a microfluidics device. 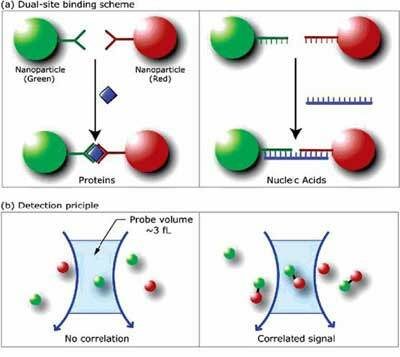 With additional work, this new approach to molecular detection could lead to earlier diagnosis of cancer and provide researchers with a versatile tool for studying single molecule processes inside living cells. By combining a nanoparticle made of a polymer produced by a slime mold with a cancer targeting agent and two therapeutic antisense nucleic acids, an international team of researchers has created a new type of nanoparticle that accumulates in brain tumors when injected into mice. 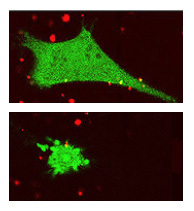 Laboratory tests also demonstrated that this multifunctional nanoparticle stops malignant glial cells from producing two proteins that these cells need to grow. 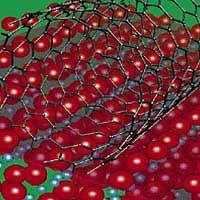 Researchers at the University of Southern California have found that sapphire surfaces spontaneously arrange carbon nanotubes into useful patterns ? but only the right surfaces. Researchers at NJIT have developed a quick and simple method to produce water-soluble carbon nanotubes. They report that the new nanotubes are 125 times more water soluble than existing ones. 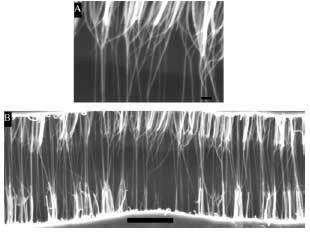 In addition, the new nanotubes, following a short heat treatment, can conduct electricity as well as the non-soluble ones. At Brookhaven National Laboratory, researchers have determined the structure of an experimental, organic compound-based circuit component, called a "molecular electronic junction", that is only a few nanometers in dimension. Georgia Tech researchers have created a highly sensitive atomic force microscopy (AFM) technology capable of high-speed imaging 100 times faster than current AFM. This technology could prove invaluable for many types of nano-research, in particular for measuring microelectronic devices and observing fast biological interactions on the molecular scale, even translating into movies of molecular interactions in real time. Until now, scientists haven't properly understood why CNT are visible using a scanning electron microscope. Stanford engineers have solved the mystery, and its explanation not only could help researchers understand what they see in nanotube images but also suggests new nanotube applications such as ultra-sensitive detection of electrons and ultra-precise electron beams for microelectronics manufacturing.